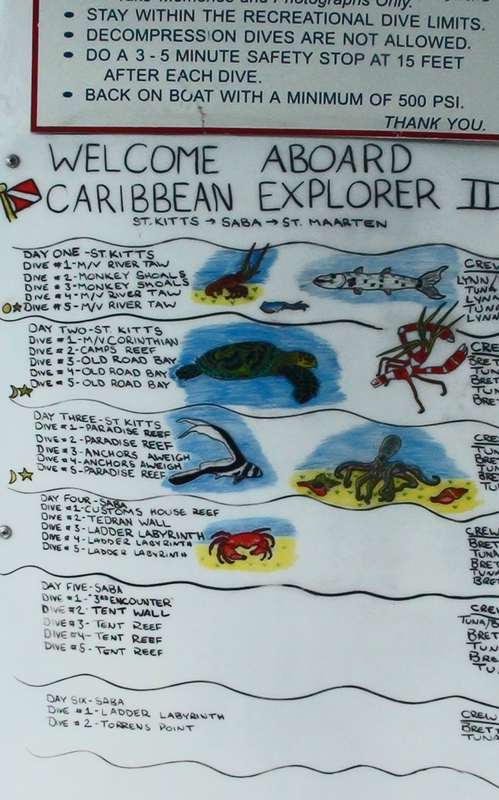 The Donkey Divers returned to the Caribbean Explorer for another week of diving. Many of us had been on this same trip 8 years but in reverse order. 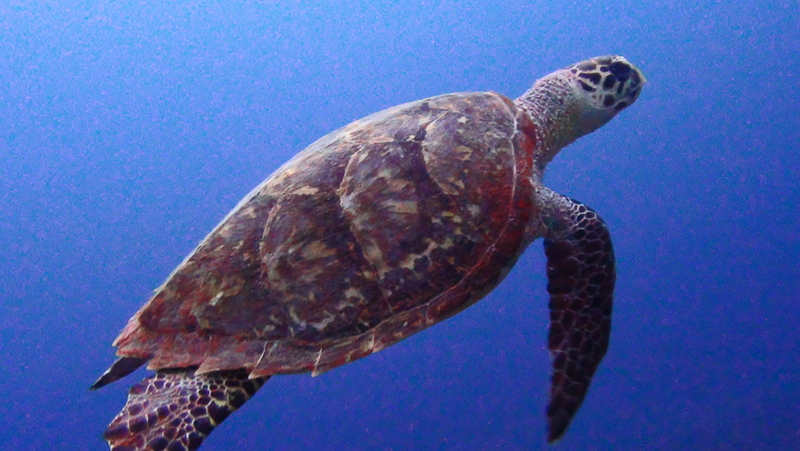 In 2003 we flew into Sint Maarten where we boarded the vessel and sailed south diving at Saba, St. Eustatius and St. Kitts where we caught a flight back to the states. This time we reversed the order of the trip. 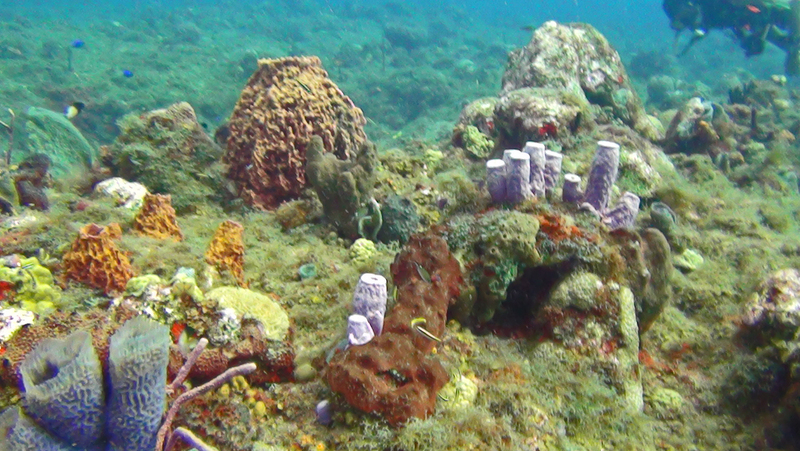 We flew into St. Kitts where we caught the vessel and then sailed north diving around St. Kitts and Saba on the way to St. Maarten where we disembarked and boarded an airplane to take us home. 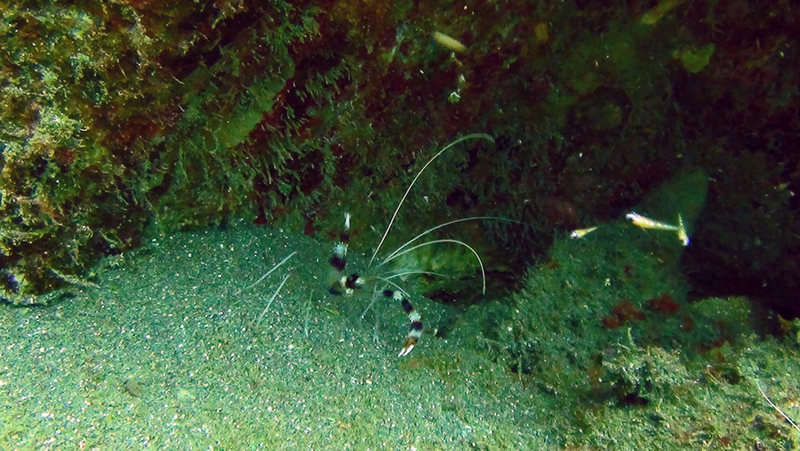 This trip, just like the other, was filled with great diving and lots of fun with a great group on the boat. 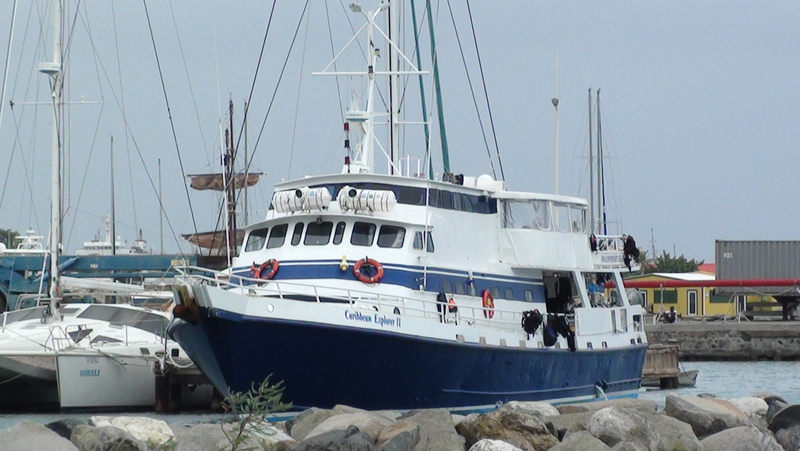 To learn more about the Explorer Ventures and the Caribbean Explorer II click on the logo below. Click on the thumbnails below to see the full size pictures. Then click the "BACK" button on your browser to return to this page. 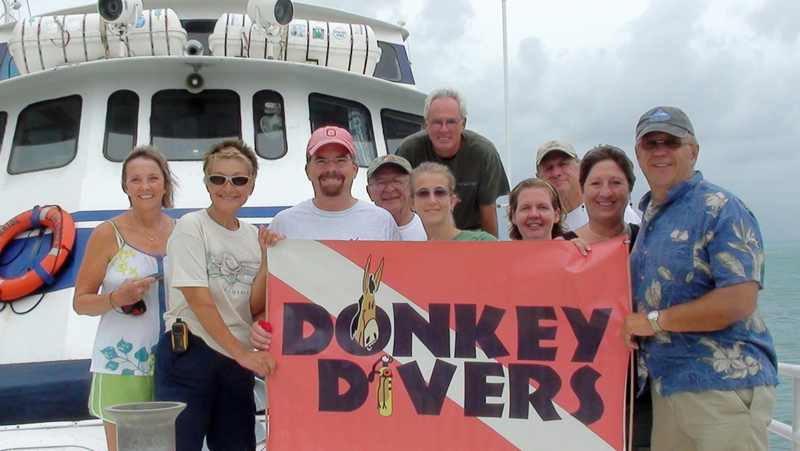 The Donkey Divers pose for a picture on the bow of the boat. 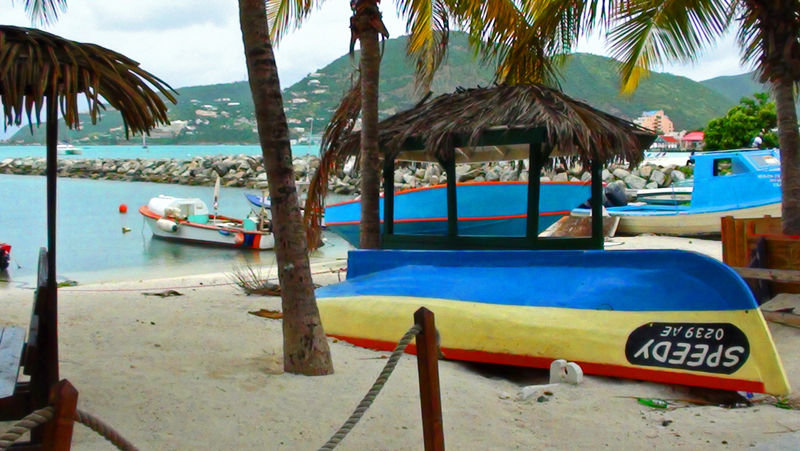 This is a picture of the Caribbean Explorer II docked in St. Maarten. 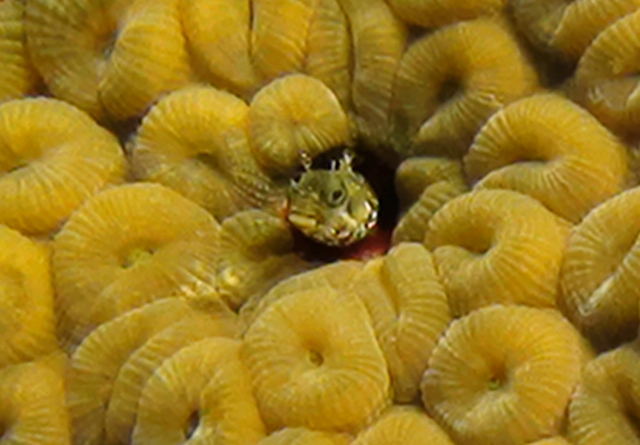 A secretary blenny pokes his head out of his home in cluster of star coral. 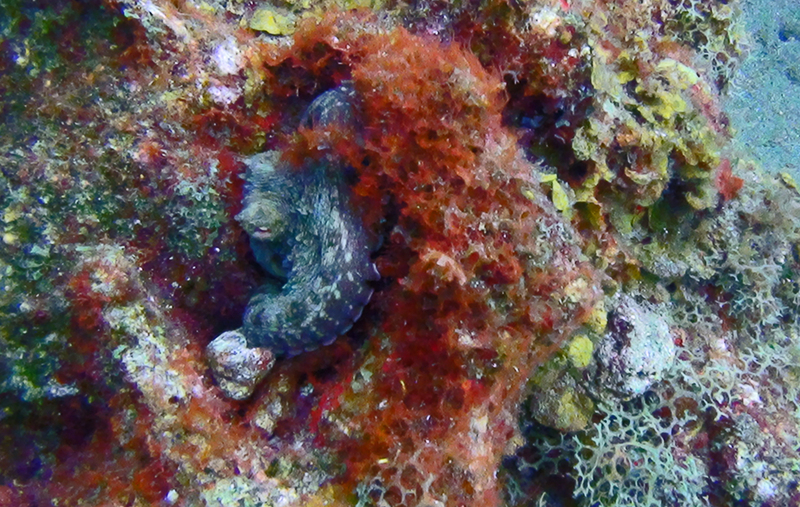 A closer look at the blenny. 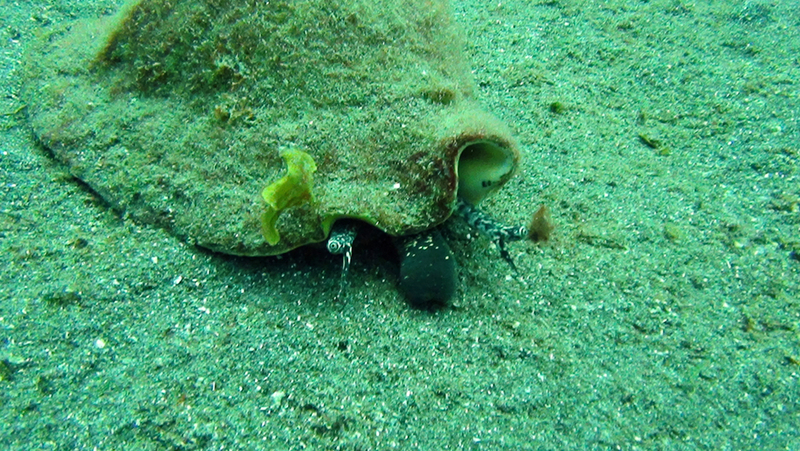 This Conch snail is keeping one eye on me as his head sweeps back and forth on the sea floor finding food. 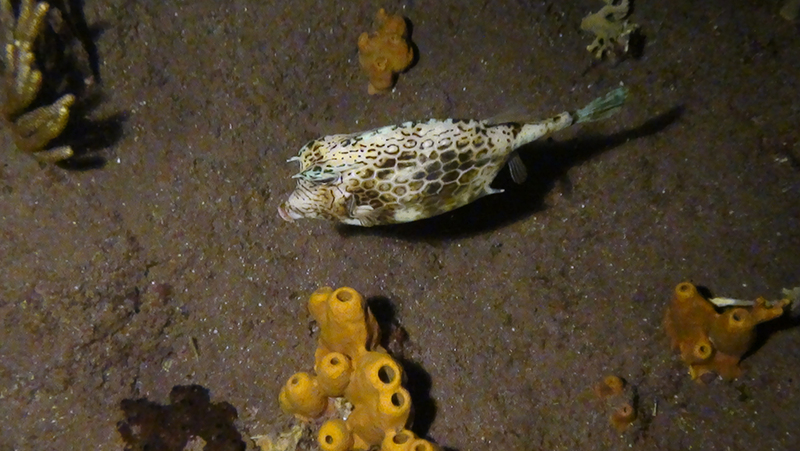 This cow fish was out swimming along the reef at night. 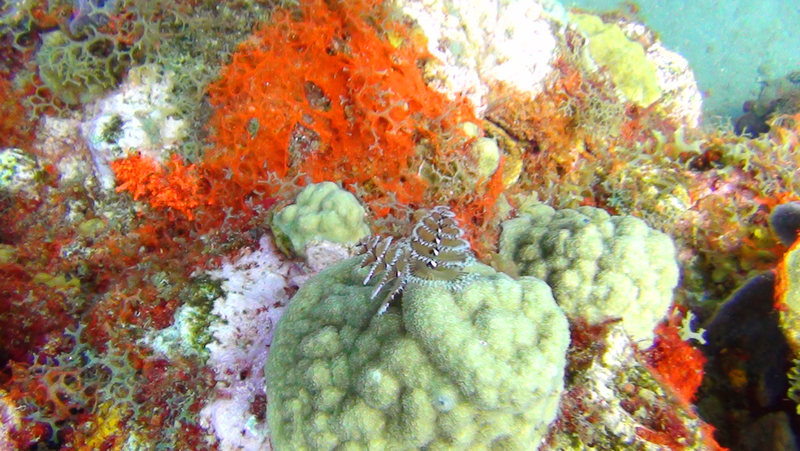 Two tiny crabs (one hermit in upper left and one in lower right of picture) are crawling around on the coral at night. 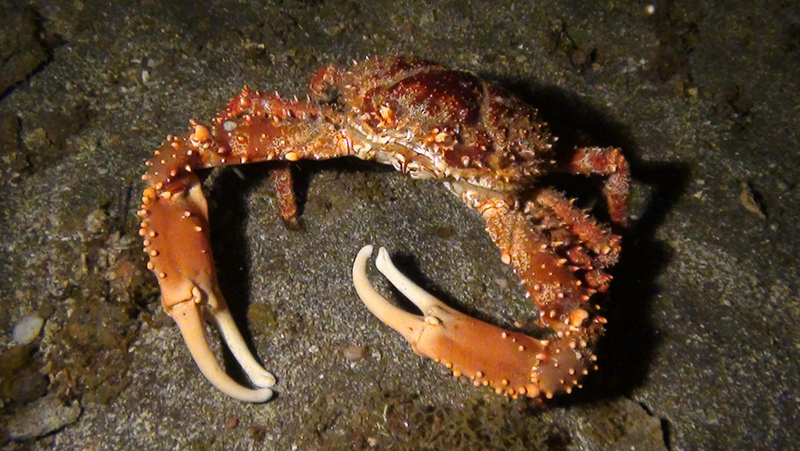 One of many huge crabs we found out feeding at night. Dive schedule for the week. 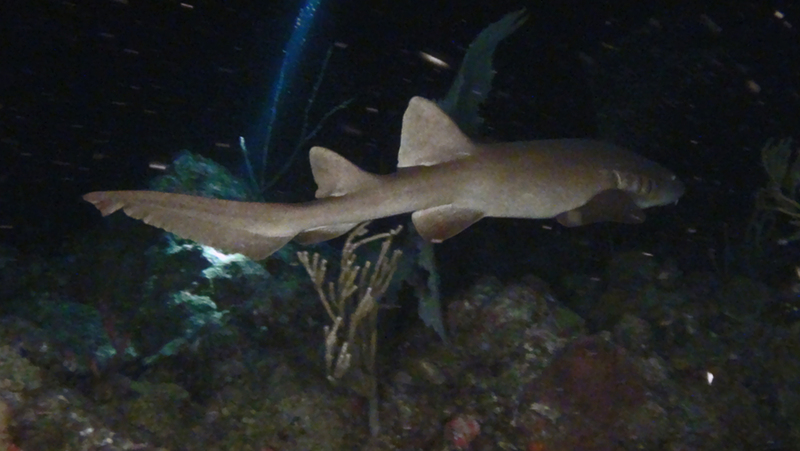 Five dives a day. Life is good when you are narced*. 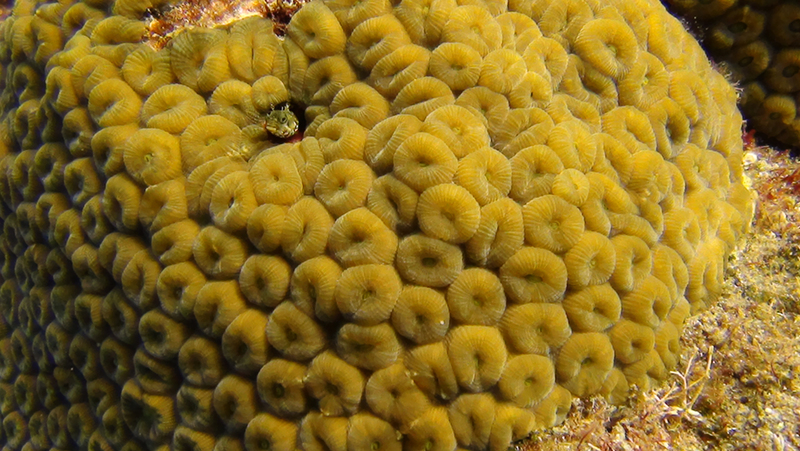 narced: verb intransitive, (slang) to suffer from impaired judgment and usually a feeling of euphoria due to nitrogen narcosis while scuba diving. 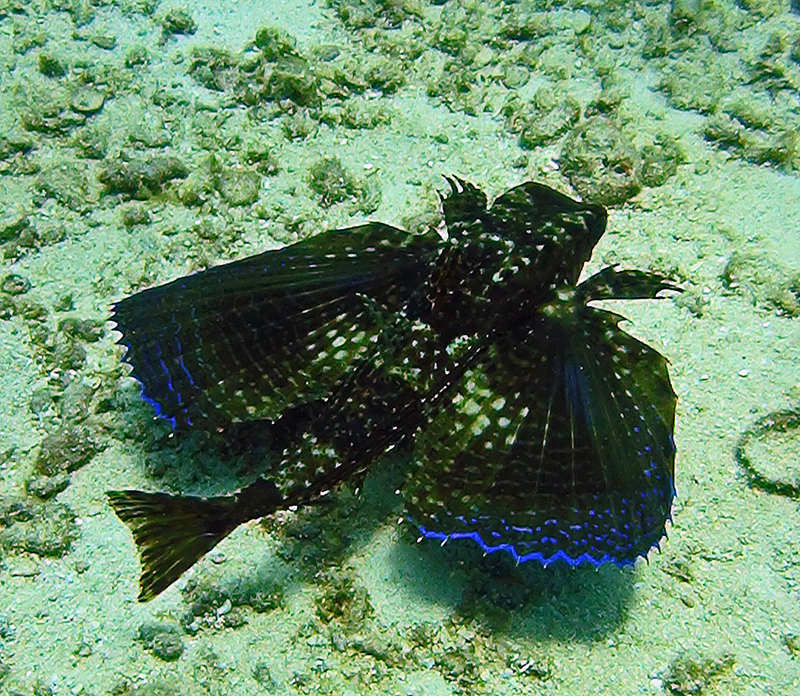 A flying gurnard. 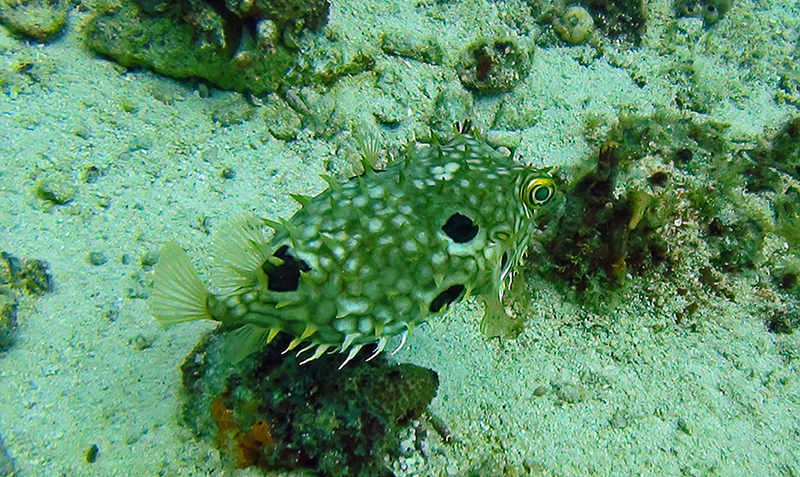 These are the "Flying fish" that you sometimes see flying out of the water along side boats in the ocean. 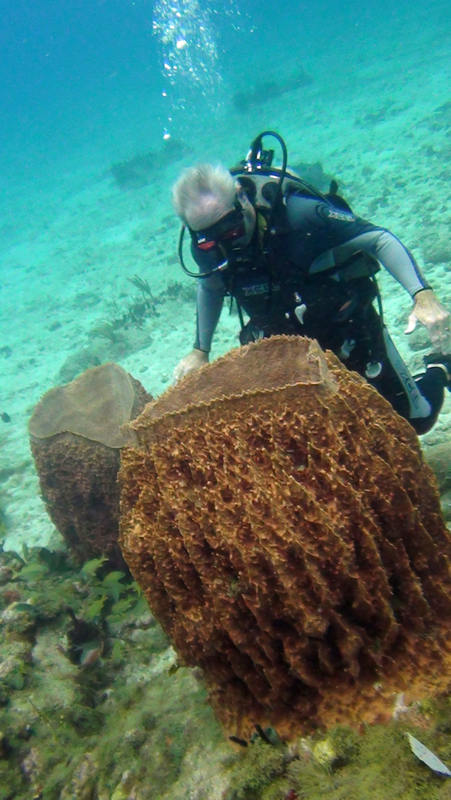 Johnny checking out a big barrel sponge. 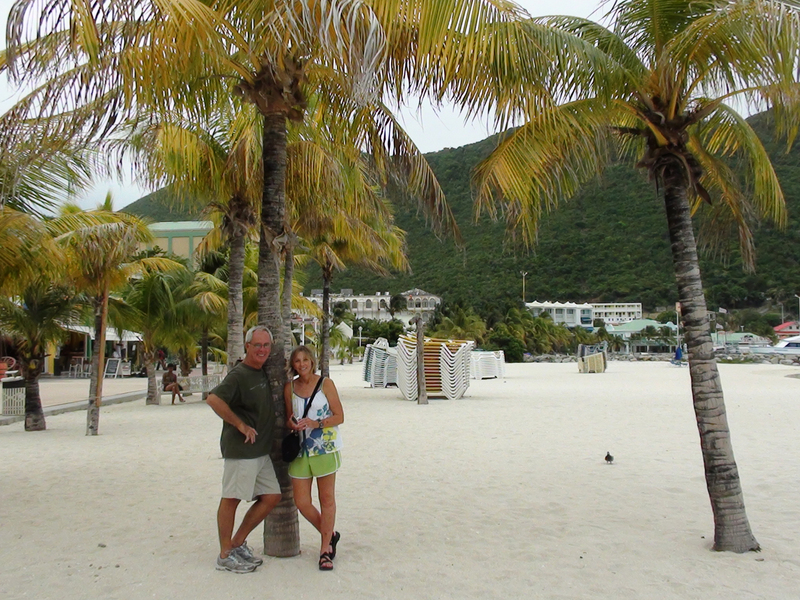 Johnny and Linda on Sint Maarten. 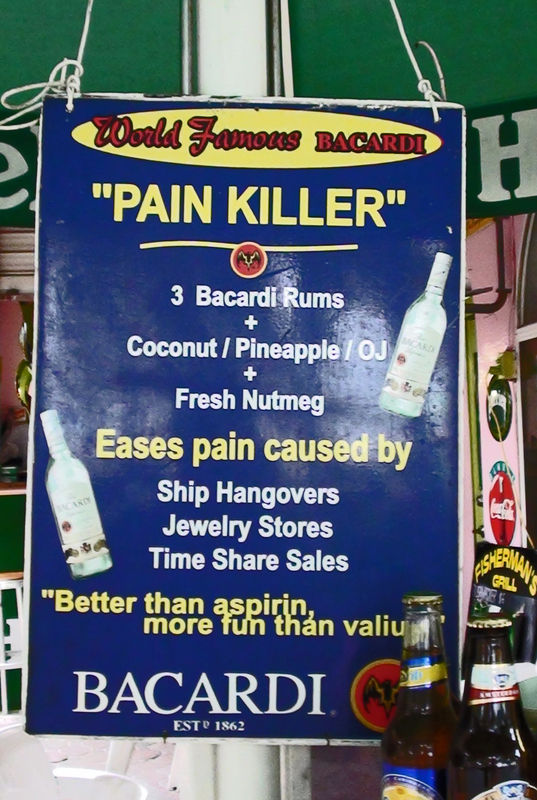 Life on the boat between dives was rough. 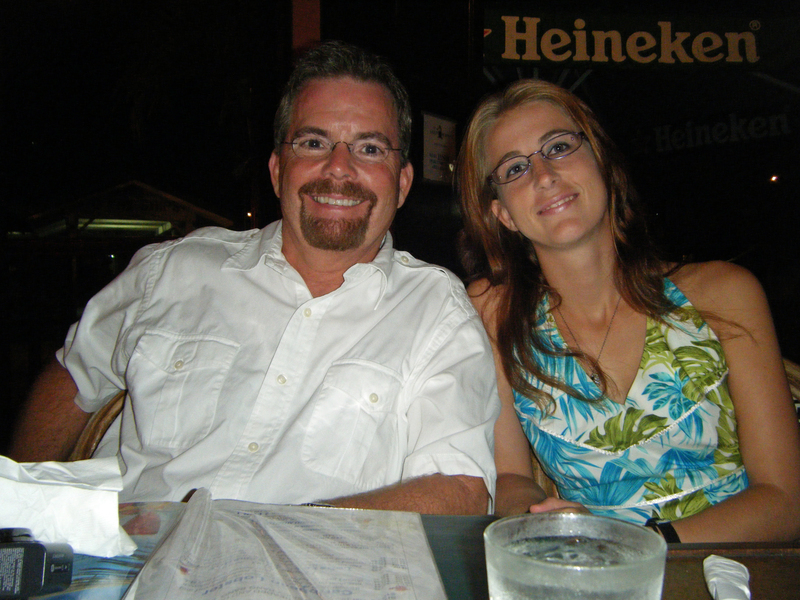 Kim and I at dinner on St. Maarten. Kim hanging on to the anchor line and flapping in the current on a safety stop. 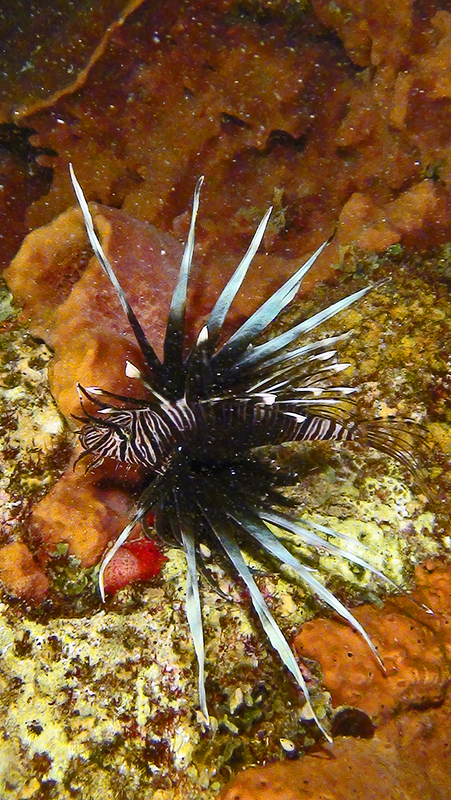 Lion fish out at night. 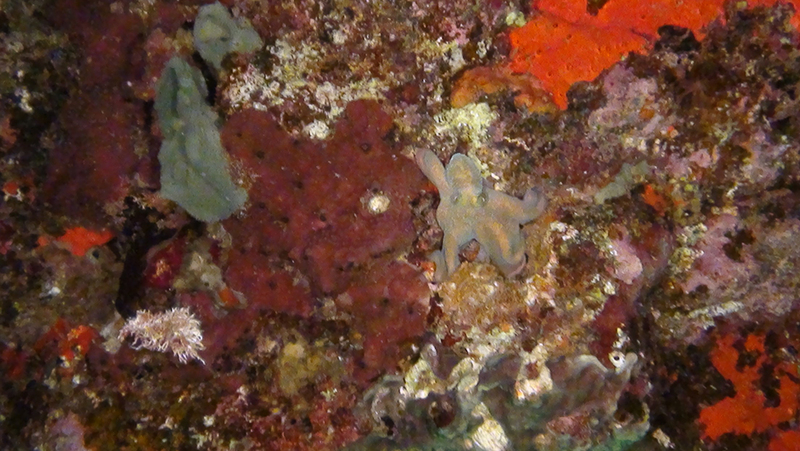 Octopus sliding along the coral wall at night looking for a place to hide. 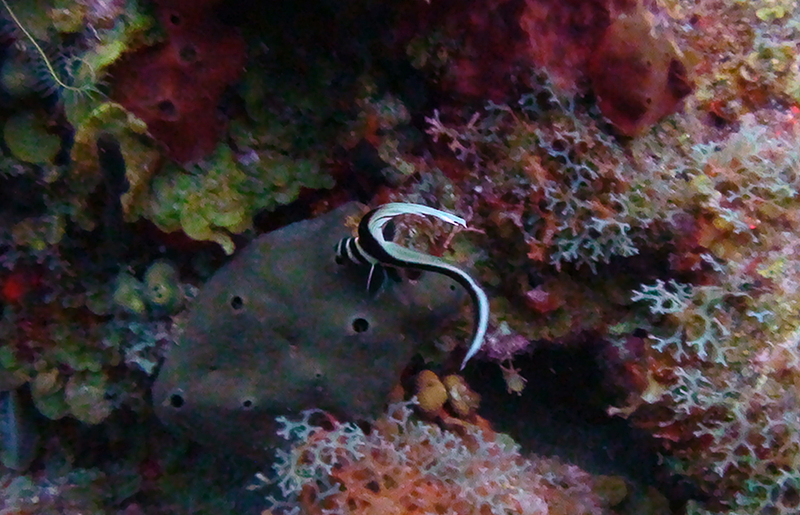 Octopus trying to hide in a hole in the day. 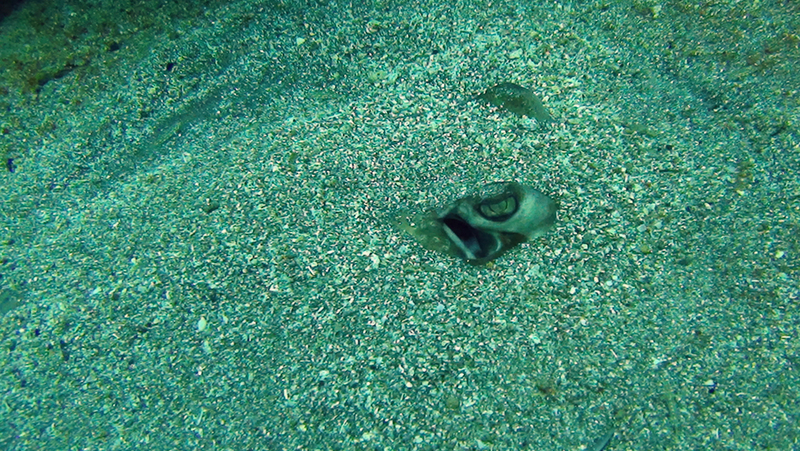 Southern Stingray (well actually just his eyes) hiding in the sand so he can rest and not be seen by sharks. 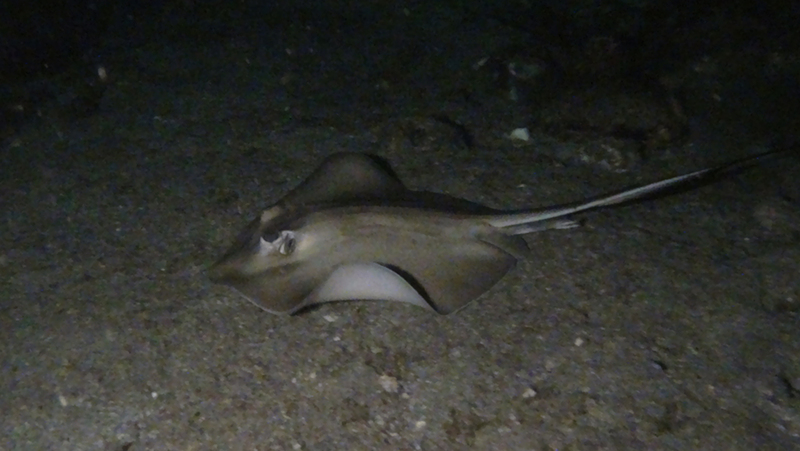 A different ray out feeding on the sandy bottom at night. 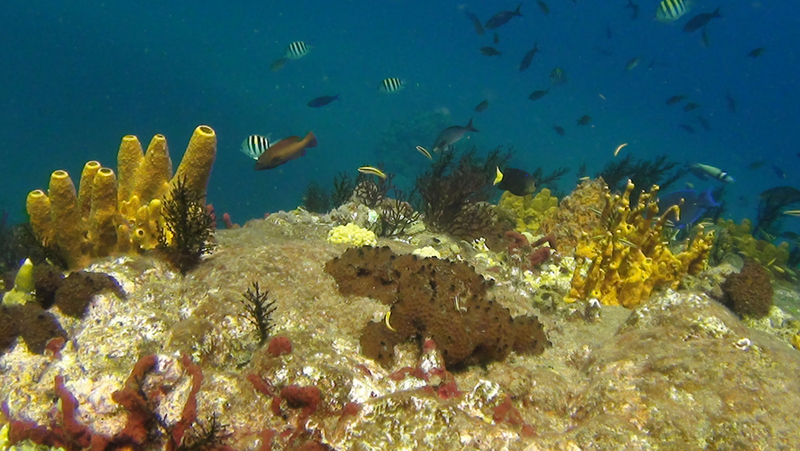 Lots of fish swimming on the colorful reef. 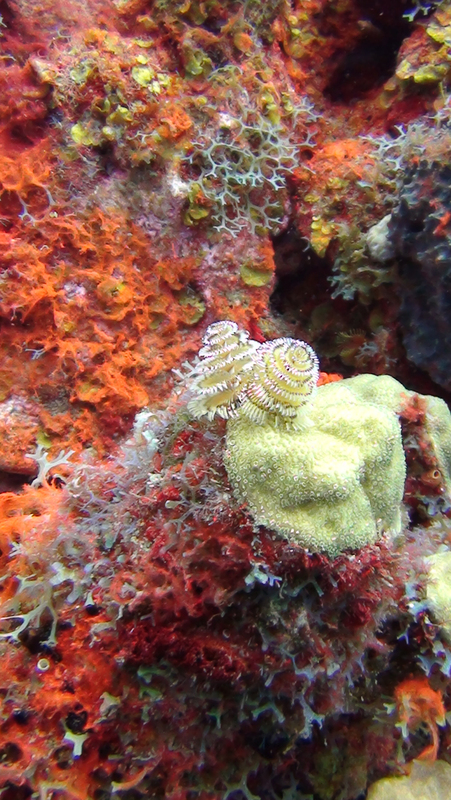 Christmas Tree Worm on a colorful patch of the reef. 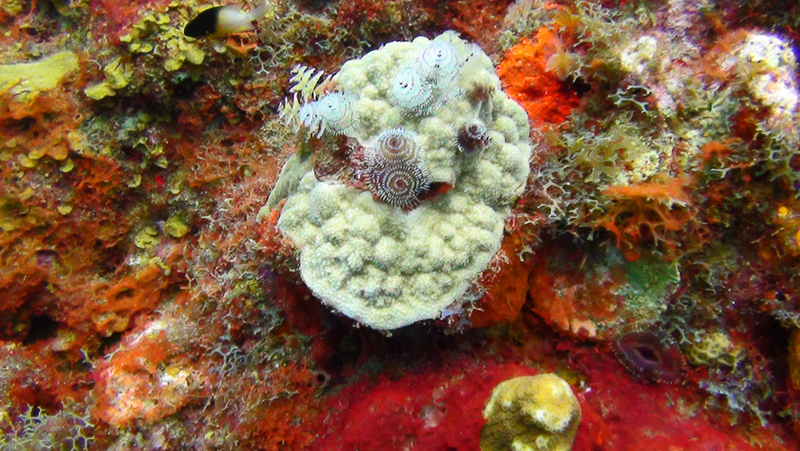 Many Christmas Tree Worms on the reef. 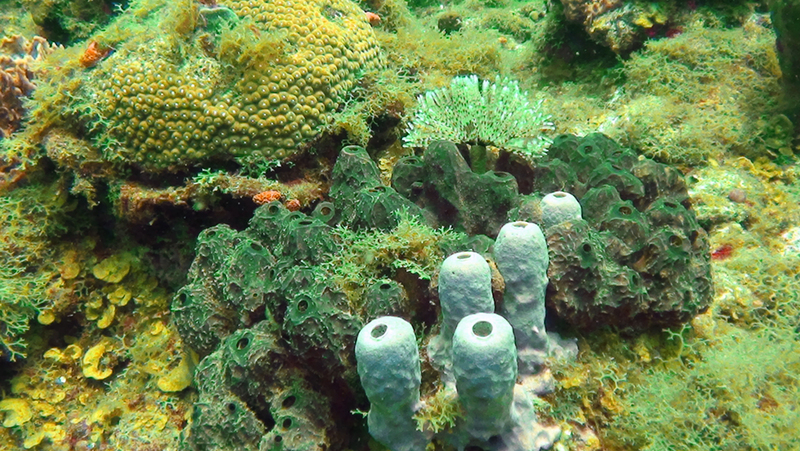 Feather duster on various types of coral and sponges. 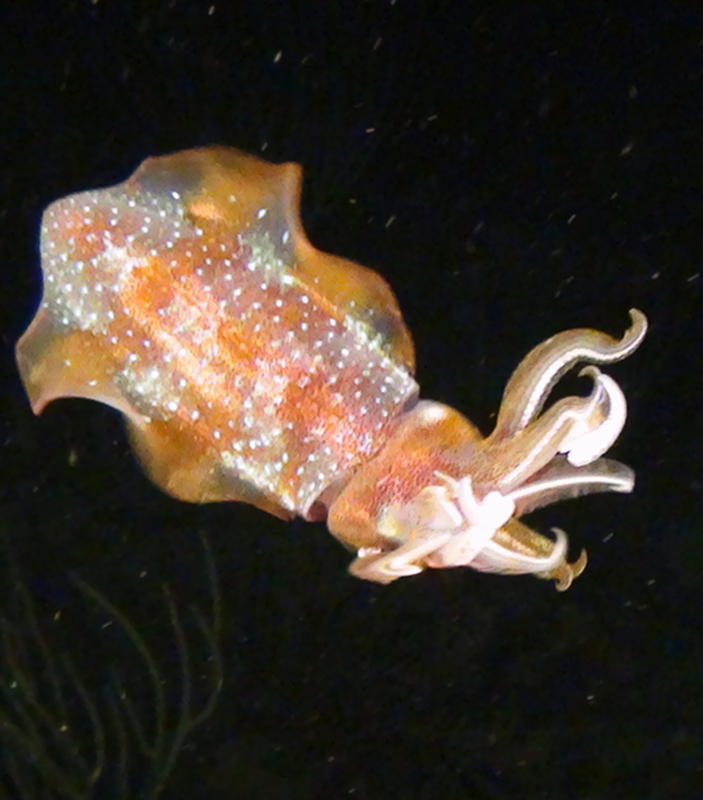 Squid swimming alone at night. 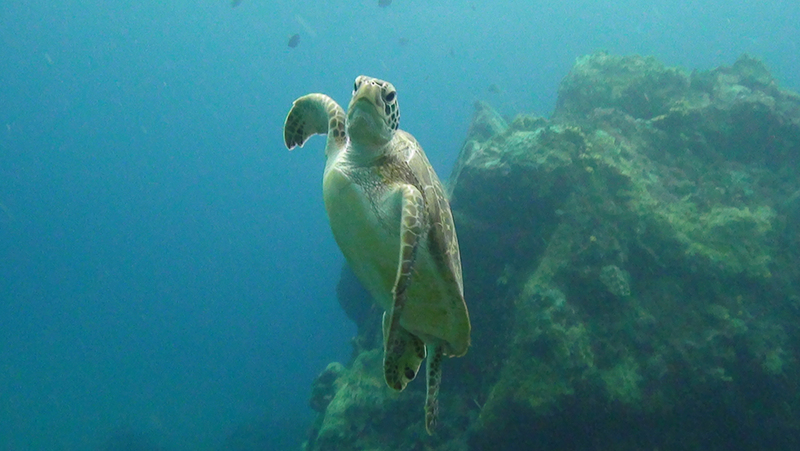 This turtle was nice enough to give me directions. 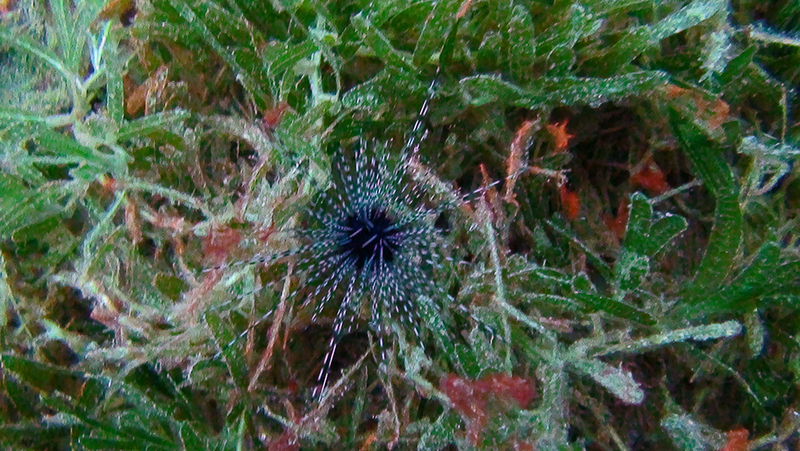 Tiny sea urchin in the grass on the sea floor. First time I ever dove with a diver who carried a chicken with her. Char claimed she was drinking non-alcoholic beverages all week. (See definition of "narced" above). 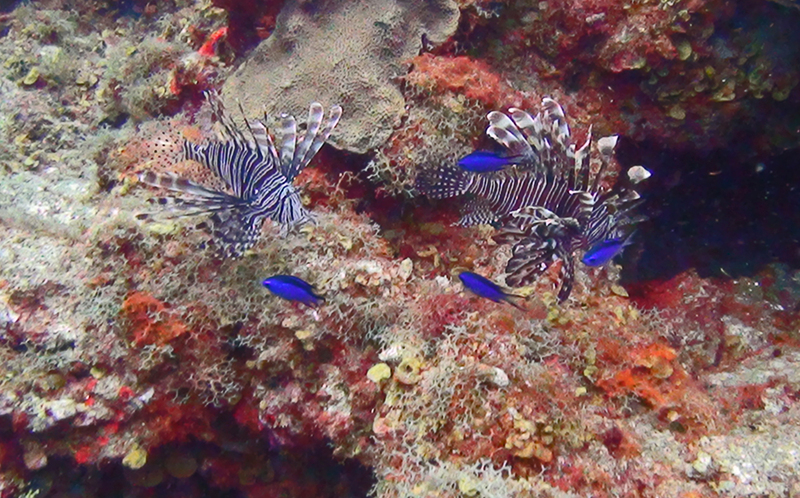 To see pictures from other dive trips, click on the button below to go to my SCUBA page. 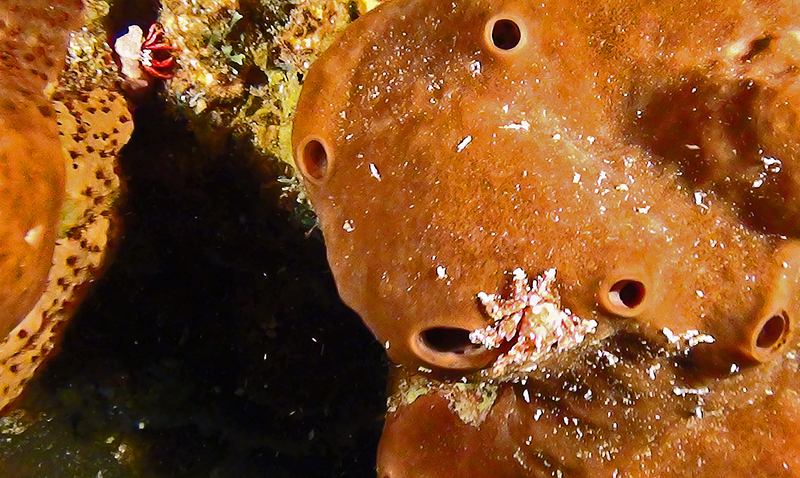 It has links to other pages of pictures and dive reports from many different dive trips over the years.